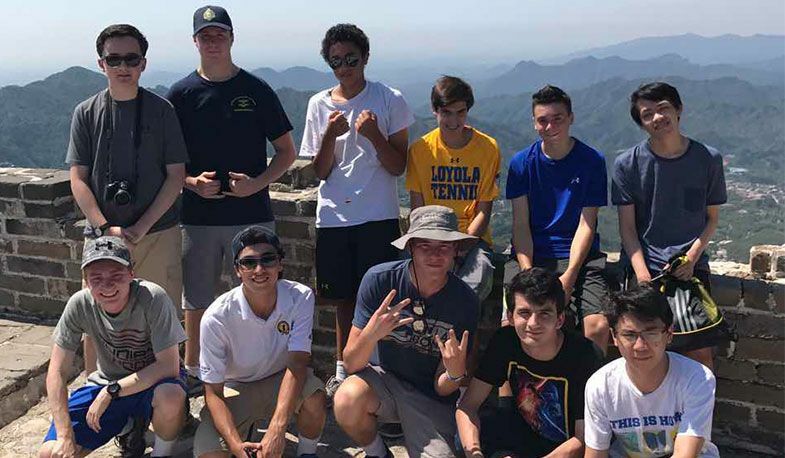 From June 13–28, I participated in Loyola Blakefield’s Ricci Experience, and it was arguably the two most important weeks of my life. When I signed up to apply for the Ricci Experience, I thought it would be fun. My freshman religion teacher, Mr. Marana, was running it with my current AP U.S. History teacher, Mr. Manelski. I went to the introductory meeting and was blown away by all the stuff we would do and the fact that we would get credit for the experience as well. After that, I thought I just had to go, because it was going to be a once-in-a-lifetime experience. One of my main goals when I left was to gain greater cultural awareness of China and other countries outside of the U.S. I also wanted to gain a sense of independence from my family for a while. I got to achieve both of those on this trip. We had a tour guide from The Beijing Center named Arthur, and he was one of the most personable guys I have ever met. I got the chance to talk to him about a lot of what it’s like living in China, as well as his perspective on American sports and people. I did gain a sense of independence from my parents, but taking classes and maintaining a scholarly environment helped a lot of the students on the trip remain in check while being so far away from everyone else. Some of the most important experiences for me were going to Shanghai and seeing the Imperial Palace. Shanghai was awesome because we traveled up one of the tallest buildings in the city and stood on a glass floor. Possibly more fun, however, was our river tour of the Bund. We got to see all the lights in Shanghai’s business district, and people would repeatedly approach to take pictures with us. The Imperial Palace was also amazing. It was repeatedly burned down, but emperors would rebuild all the different types of buildings and have the designs hand painted over again and again. Another highlight was going to the Great Wall and a village bed and breakfast called the Little Yard. The Little Yard was a small area about an hour and a half outside of Beijing, where we stayed overnight before seeing the Great Wall the next day. The Little Yard presented us with many different opportunities which included making dumplings, exploring, and teaching kids English. The fifteen of us learned how to make dumplings. That was awesome because we learned how to make one of the staples of our meals. When I got back, my uncle already had a dumpling-making handbook ready for me. After we made dumplings, we got to explore around for a little bit, and we learned about the sense of community that is shared in China, at least where we were. Everyone was nice and those who spoke English came up to us and had conversations with us. Lastly, six students (Andrew Melvin, Matt Tan, Ty Schumacher, Michael Vaughn, Tiernan Brunner, and I) taught three kids some English, which was so much fun. We divided into pairs of two. Tiernan and I worked with a young boy named Harry, and we taught him the alphabet and the pronunciations of some of the letters. Now whenever he wants to say “J,” he actually says “Jake.” So that will have to be ironed out at some point. The Great Wall the next day was fun too. The section of the Great Wall that we went to prohibits access at the twentieth tower, but you can go past it without anyone stopping you. Eight of us moved on and made it all the way up to tower twenty-two. It was an exhilarating ascent but definitely worth the struggle once we got up there because the view was breathtaking. One of the most important things I learned over the course of the trip is that when I was in China, I could not really tell that it is communist. The best way I can describe the feeling I got while in China is as follows: since we had school still, it was hard to perceive that we were on the opposite side of the globe. It just felt like a very large, much better version of Chinatown. The people there are all really nice, and besides military presence at some historical sights and at Tiananmen Square, one can’t really tell that China is communist. The people there do not act like they are being oppressed at all, and they live in a manner pretty similar to the way we do. I also learned that the world is a lot different than what we are taught in United States schools. I learned that every country has its own views on history, and we can only understand history by what we see and by learning from both sides. For example, the National Museum in Beijing never mentions the U.S. dropping the atomic bombs on Japan. They act as if Mao Zedong defeated the Japanese and then came back a hero and god to China. Lastly, I learned that I am a good leader. When we were there, I would be taken to places around campus where we were staying, and we could go back to those places during free time. I would then take people where they wanted to go off campus. They mocked my sense of direction, but still they followed me because they didn’t know where to go and just didn’t want to admit it. Overall, I cannot stress how much fun and what a life-changing experience the Ricci Experience was, and I would do it again a thousand times over.